A friend of mine commented that he envisioned the GooglePlex resembling Willy Wonka’s Chocolate Factory, with gum drop trees and candy coated sidewalks. I was there a few weeks ago to preview yesterday’s announcement of the Google Analytics upgrade and my friend wasn’t too far off. The full sized dinosaur, beach volleyball game, groovy red couches and delicious food as far as the eye can see looked pretty cool to me. 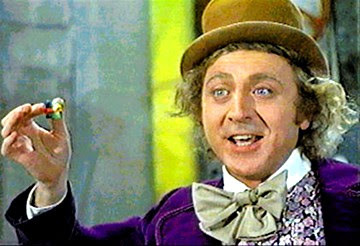 And, the new GA tool may just have the staying power of an everlasting gobstopper. Jeff Gillis provides the official blog post about the upgrade and Justin Cutroni of EpikOne added his live from the eMetrics hotel room video of the impressive new features. Yet, Avinash’s delivery of the upgrades was truly enthusiastic. New Interface – a new and fresh look is always a good thing, but the tabbed browsing of reports is both contemporary and useful. They also added the ability to monitor multiple accounts within a combined dashboard that provides comparable metrics right up front. This view will be great for organizations managing multiple web sites or those that want to extract a snapshot of multi-site data to push out tailored reports to executives, directors or others within their organizations. AdSense Integration (private beta) – revenue, impressions, click throughs and more. AdSense info will be accessible within the GA interface under a dedicated AdSense link in the nav structure. Publishers will be invited to try out the new method for digging data on a roll-out basis as they ramp up to scale and it eventually becomes available to the masses. This should present opportunities for publishers to advertise more effectively. Custom Reporting – now here is where things start getting fun… The upgrade provides the ability to drag metrics such as visits, conversions and revenue and drop them into the custom report creator. Then users can select dimensions like keywords, content or campaigns to evaluate against the metrics. The tool is color coded such that blue represents metrics that form columns and green boxes are dimensions depicted in rows. Each custom report can be saved, shared or edited. Imagine creating multiple reports for stakeholders based on their needs and having them accessible as tabs across the custom reporting interface. Advanced Segmentation – segmentation is the lifeblood of Web analytics and now Google just provided a transfusion. Choose from a list of predefined segments, with multi-select capability or drag and drop into your own advanced segments and slice and dice to your hearts content. Segments can be used to glean insight on real-time info or saved and applied to historic data as far back as necessary. Further, they can be created using “and” “or” statements to refine or expand data sets. All segments can be tested in preview mode to determine if the sample is acceptable, then saved for use against any data or in conjunction with other segments. Data Visualization – originally dubbed the Trendalyzer (by the Swedish statistical analysis tool GOOG picked up in ’07), Motion Charts provide data visualization across 5 (count ‘em, five) dimensions. X axis, Y axis, color, size, and time. Time is probably the coolest dimension as you get to see where keywords, revenue, or other metrics perform over time. By linking to charts, saved reports can be played back repeatedly or saved and shared via URLs that can be applied to any GA account on their own data. For GAACs this is a powerful feature that can be used to generate reports that scale across multiple clients. Open API (private beta) – perhaps the pinnacle of free, the highly anticipated, much appreciated Google API now exists. While this feature is dependent on your imagination and that of thousands of global developers, the API makes Google Analytics truly extensible. Expect to see Google Analytics data in more permeations than you ever imagined. I foresee an infiltration of GA data into progressive organizations of all sizes; providing indispensable value for users that never have, and perhaps will never need to, log into the interface. If you’ve got an existing GA account, request the upgrade asap so you too can acquire a golden ticket and gain access to the chocolate factory. How do I request the upgrade to 3.0? The features seem great, but I can't see any of them in my account. Thanks. John, I'm glad you enjoyed the tour and the launch. I really enjoyed the post! Doug - try emailing ga-feedback@google.com to request the upgrade. Analytics Evolution is a blog dedicated to my ramblings about Web Analytics, Web Content Management (WCM), Site Search, Searchandising, Navigation, ECommerce, Web Page Performance, Content Delivery Networks (CDN), Rich Internet Applications (RIAs), Dynamic Content Delivery, Widgets and whatever else John Lovett, Sr. Analyst for Forrester Research decides to riff on. Analytics Evolution by John Lovett is licensed under a Creative Commons Attribution 3.0 United States License.